POSITIVO ESPRESSO: 600 km Brevet with Tail Wind -- In Both Directions! 600 km Brevet with Tail Wind -- In Both Directions! This weekend Jerome and I joined the Saitama Audax-sponsored 600km May 7 “Attack Fukushima Nihonkai” Brevet. Jerome drove up to my house just after 5AM Saturday, and we loaded my bike and gear into his car for a quick drive to the start at Iruma City, Saitama, just under the Toyomizu Bridge on Route 407. After signing in and getting my Brevet Card and was talking to several of the organizers, including Shiroki-san, the lady who manages the PBP entry process from Japan, Jerome strolled up to me and asked if I had a spare pair of shoes. No, I had just my cycling shoes, not even slippers for the car ride. Jerome was wearing flip-flops. His cycling shoes had not made it into the car. Nor had he any other shoes, for that matter. Fortunately, an announcement of his plight at the end of the pre-ride briefing caused one of the 50+ other riders in the 7AM start group to take pity and volunteer that he had a pair of 27cm casual sports/running shoes in his car. They fit Jerome’s feet well enough, and he decided to ride the 600 km with them. Like I said, I’m not crazy. I wonder if perhaps Jerome did not forget his cycling shoes at all, but had another sub-conscious motive. Perhaps he had considered the 400 km rides too easy? Maybe he studied the weather forecast, anticipated the tailwind(s), or the need to ride more slowly with me … and decided he needed a handicap? Or maybe he just wanted more comfort when walking around off the bike at the checkpoints; we all know that cleated cycling shoes can be uncomfortable and treacherous – perhaps he wanted to avoid any more slip-and-fall incidents if we happened to stop at Restaurant Gusto? 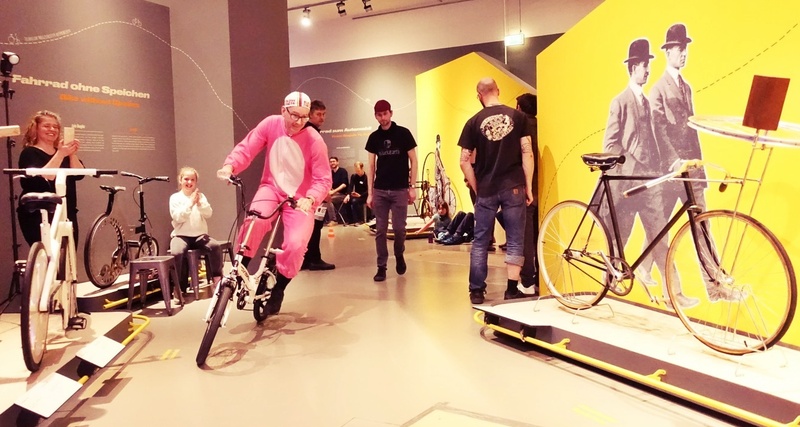 In any event, given his low cadence, stomp-the-pedals technique, it proved only a modest handicap. Perhaps he is crazy, like a fox. Pre-Ride Briefing under Toyomizu Bridge. Shiroki-san, who handles Japan's PBP applications, is in the grey sweatshirt at the back of the van. She rode the route in a car snapping photos of smiling riders cresting hills. Saturday’s weather forecast was mixed, with the “folded umbrella” sign suggesting potential for light rain throughout the day in much of Kanto. Sun was predicted for Niigata on Saturday, then perhaps rain at night (heavy at times), and sun again on Sunday. In any event, it would be warmer than on April 23 when we suffered through ice cold rain on a climb in Nagano. We managed to join a fast, lead group from the 7AM start at one of the early traffic lights and rode with them for quite awhile. One member, Azuma-san, had ridden at Chiba with Jerome the week before (and also was known to me from at least the Chubu 1000 event last October). The group included Kondo-san, who was identified to us by the two organizers who drove the course and were waiting at each checkpoint (Take Kawano, who attended university in the U.S. and so speaks native-level English, and a woman whose name I did not get, who said she used to ride Brevets but has not done any in the past 2 years). Kondo-san’s name was spoken with some reverence by just about everyone, including the organizers. He completed the 600 km in around 25 hours – first to finish by a huge margin. I see from Audax Japan’s listing of results from prior years that his time for last October’s Saitama 600 was 2 hrs 40 minutes faster than the second rider and over 3 hrs ahead of #3, with the next 100 riders much further back. A decent tail wind made it easy to ride in a group at 38-40 kph, subject to frequent interruptions for traffic signals. Despite the stop-start and the urban sprawl, my average moving speed over the first 50 km was above 29 kph – excellent for a Brevet. But then a dropped cue sheet led to a missed red light, and I lost contact with the fast group. A bathroom break and a wrong turn (adding 2 km – 1 km out and 1 km back after realizing my error) put me further behind. I had used Ride with GPS and drawn the GPS track for this ride, separating the ride into “outbound” and the “return” legs and loading them onto my Garmin Edge 705. (Please click on the links to see these routes -- and let me know if you have any difficulty accessing them. It is very easy to draw the tracks, for any of you Garmin users who have not tried it). Unfortunately, when testing whether the track was actually visible on my Edge 705, I left the “return” leg showing on the map, instead of the “outbound” … which did me no good after the two routes separated about 30 km into the ride. I took a few minutes to fix the problem to avoid further wrong turns now that I was apart from the lead group. Jerome, who had struggled the first 10-15 km as usually, was finding his form and stayed with the leaders to the first checkpoint (97 km). I caught another group, but found it difficult to ride with them. The lead rider refused to move up alongside a line of cars to a traffic signal, or to anticipate the light changing to green by clipping-in and getting ready to go. When he did go, however, he accelerated with a burst that caused my legs to throb after 15 or 20 traffic signals (we hit at least 10 red lights going through central Takasaki) … only to go into cruise control once the speed got up to around 35-37 kph, slower than the other group and slower than easily manageable in the tail wind. Finally, the group scattered a few kilometers before the first checkpoint, leaving me behind on a hill … only for me to catch and pass a good number of them between the crest of the hill and the checkpoint. In Takasaki, we passed by a group of 5 or 6 Positivo Catteni riders, who were at the roadside with bikes, apparently to meet and cheer on one of their members. The Catteni rider in our event, who we saw at later checkpoints, said he plans to do PBP, as will Shintani-san, and several others from Catteni who had ridden the Chiba 400 last weekend. After leaving the first checkpoint, Jerome and I rode as pair, quickly joined Gunma Route 36 and started a hilly section that included the only really steep-ish climbs of the trip – a few kilometers of 10%+ sections, though nothing like Wada or the other forest roads I had ridden recently. We started passing riders from the 6AM start in greater numbers. I made it up these climbs without problems and felt vindicated in my equipment selection. I was riding the “bulletproof” wheels Nagai-san built for me at the end of 2009, with the heavy gauge 36-spoke rear/32-spoke front wheel and 2x spokes tied together (Mavic Open Pro CD rims, Ultegra hubs and a 12-25 cassette -- instead of my usual 12-27 or 11-28 cassettes). With a compact crankset (50-34), this was plenty of gearing. The wheels, and new Vittoria Open Corsa CX tires, had a plush, stable, confident ride quality and the Open Pro CD rims an excellent, even braking response … even if they are noticeably heavier and do not spin-up quickly. We reached the end of Gunma Route 36 and joined National Route 17 (Mikuni Kaido) for the major, gradual climb of the trip, up the mountains, through a tunnel and down into Niigata via Naeba, Yuzawa, Minami-Uonuma and on toward Nagaoka. The cue sheet became irrelevant – “take the next right turn after 91.8 km on Route 17”. This was at least shorter than on the “return” leg, which takes Route 17 for 127.4 kilometers, after another 17 km which is mostly on other roads, but parallels Route 17, just to mix things up. After an unscheduled rest stop at 600 meters elevation, at a very nice Lawson with a picnic pavilion in back overlooking the deep green waters of the lake behind Aimata Dam, we started to climb up the last 10 km and 500 meters of elevation gain to the tunnel. I felt strong and climbed ahead of Jerome, passing several groups of riders who had left the Lawson before us, as well as more 6AM starters. On the descent between Naeba and Yuzawa -- well after passing the skycraping condominiums of Naeba. Even after we reached the lower elevations, and were riding on the flat or, at best, a 1% downgrade, we made great time, the wind generally at our backs and snowcapped mountains off to our right. We finally turned right onto National Route 252, rested briefly at checkpoint #2, already 215 km into the ride, and headed up a gentle valley next to a roaring river, with snow in patches all around, even at low elevation. We turned left and up a short climb on National Route 290. As we began a long, winding and gradual descent, there was still light in the sky, but the sun was very low somewhere off to our left behind the nearest hills, and the snowcapped mountains in the distance to our right were turning a reddish hue. Birds were singing. We passed flowering trees (the sakura must bloom almost a month later here than in Tokyo, 200+ km to the South/Southeast, just as it stays light noticeably later). There were patches of melting snow everywhere, and people outside working in the fields or chatting with neighbors. The overall impression was surreal, like a fantasy movie. Is this the Shire? Or is it one of the scenes from Kurosawa’s bizarre late-period effort “Dreams”? Darkness descended after we returned to the flat and approached Mitsuke, Sanjo and rice growing areas north of Nagaoka. The frogs begin to sing, very loudly, among the rice paddies. As we approached the third checkpoint, still before 8PM, some big flashes of light filled the sky to the West, out over the Japan Sea. Luckily, the rain started while we were still at the 3rd checkpoint, under cover of the convenience store roof overhang. We donned our raingear -- Jerome put on the blue sail poncho -- and the Japanese riders and organizers looked a bit incredulous at us planning to ride in shorts, bare legs exposed to the falling water. But the rain was cool and soothing, not freezing. The rain strengthened as we headed toward the coastline, about 4 km from the checkpoint. After a short climb, I entered a tunnel ahead of Jerome and maybe 5-6 others we passed since the stop. I exited the tunnel into heavy rain, made a sharp left at the “T” where National Route 460 ends, joined National Route 402, the coast road, and continued for a few hundred meters in drenching rain. I could barely see the mouth of the tunnel on Route 460, and in the dark I thought I saw Jerome (or at least it could have been Jerome – with one light on his helmet and one on his handlebars) exit the tunnel. But he did not show up where I am waiting. A few other riders came along and passed – he must not have crashed or slipped, so must have turned the wrong way at the “T” and gone down the hill heading North toward Niigata City. I figure he will catch on quickly and turn around, when he finds himself completely alone, no one in front or behind. I pushed on. The cool rain felt great, as long as I kept moving and avoid being drenched by the occasional car or truck – almost no traffic now, but one car going North got me good with a splash that crosses from a trench in the far lane. I passed more riders grinding it out in their heavy rain pants and rain parkas, and arrived to Checkpoint #4 before the organizers, almost passing the convenience store in the dark since there were only two cyclists there and two more whom I’d just passed on the approach. (The store manager turned on his front overhead lighting once a large group gathered). Take Kawano and the-nice-woman-whose-name-I-did-not-get pulled up soon after in the car, and reported that Jerome was en route, still quite some way back, having made the wrong turn as I feared. I was feeling guilty – if I had been more mentally focused, I would have found a dry spot, pulled out my mobile phone, and tried to call him right away. At the checkpoint, I waited about 30 minutes, standing in a small space between the open convenience store door and its front window/wall, just under the roof overhang. A small frog walked up the crevice where wall met door, just over my left shoulder. I got cold despite some convenience store hot green tea, and my muscles stiffened. On the bright side, it was only another 10 km to the hotel where I had booked rooms, right in front of Nagaoka Station. We arrived as planned, just before midnight, 350 km done, 250 to go on Sunday. After a bath, and about three hours of sleep, we met in the lobby a little after 4AM. We ate a pathetic partial/first breakfast at the convenience store across the street, and pushed off around 4:30AM, extremely grumpy. As we headed out of Nagaoka City and to the South, just about every convenience store we passed had at least one bike in front of it. We were riding into a headwind, not heavy but noticeable. The damp road dried quickly with the light of day. We passed riders and made it about 35 kilometers before I cried “uncle” and we pulled over at a Seven Eleven. At least there I could get a familiar ham and cheese burrito wrap (210 yen), and drink enough liquid to re-hydrate a bit more. We started again, the wind gradually shifted, first to the left/rear quarter and then directly to our backs. We continued the endless stretch on Route 17, the tailwind partially compensating for the gradual uphill slope, then after a quick stop by the roadside, the real climb began after the Yuzawa-cho town office. Jerome felt strong and took off, refusing to be bested by another rider who was climbing near us. I stopped briefly to rest, near collapse, and told myself I’d be fine as long as I got some more food, and refilled my nearly empty water bottles, at the next convenience store. Unfortunately, there was no “next convenience store” for many kilometers. I slogged along the remainder of the 15 km uphill to Naeba. Stopping to rest just short of the “false summit” at 1000 meters elevation, before the dip down into the ski area, a woman rider came zooming up the hill. She asked if I was alright and I said that yes, I would be, as soon as I got some nutrition. She unzipped her front handlebar bag to reveal at least 10 different choices of snack, and offered me several of them. I took the Snickers Bar and thanked her. That got me over the top and down into Naeba, where I got some water (the greater need) and some instant cup noodles. The proprietor told me it was exactly 3 km from his store to the mouth of the tunnel at the hilltop. I was up the hill a little after 11AM – no idea how far ahead Jerome had gotten – and came out the other side knowing that the hard work was all done, ready to relax and enjoy the descent. I felt a few drops of rain from a storm cloud perching just over the mountain top – again a reminder of riding in the Alps. After the first few turns of the descent, I was hit by sudden, fierce gusts of wind. I could see dust and leaves flying left, and right, ahead of me, both directions at the same time, and struggled to hold the bike upright. Then the whole mess zoomed toward me. I almost came to a stop – not sure whether because of the wind gust or because I grabbed the brakes … and the particulate entered my eyes. In any event, I pulled off and washed my eyes with water, then some eye drops, and could see well enough to fight the wind – gradually diminishing with elevation – and get back to the Lawson at 600 meters. The take away point: always put on your sunglasses before you start the descent. From there it was a fast trip, more tailwind, down Route 17, around Numata and through a gorge filled with a rushing Tonegawa. I joined, but was having trouble keeping up with, about 5 other riders. Near Shibukawa, where the route turned East onto Gunma Route 34, I pulled over to rest and called Jerome. It turned out he was just behind me, 200 meters down the hill around a corner. He had waited an hour for me at the top of the climb, then given up and continued on, only to miss the turn off of Route 17 and go further, asking numerous people for help before finding his way back onto the course. We went a few km further and then pulled into a local historical society “shiryokan” which also had a vegetable stand of sorts and a park. I lay down in the grass under a beautiful “iroha momiji” tree, the wind rustling and tree swaying, beautiful blue sky and puffy white clouds. I felt as if I were Tolstoy’s Prince Andrei in War and Peace, lying wounded at the Battle of Austerlitz, staring upward and contemplating life. But it was time to move on. We arrived at the last checkpoint and found some of the riders who I had had difficulty keeping up with along the Tonegawa. They looked like they also had just gone through the Battle of Austerlitz, but their faces were drained of all color, and eyes were not facing skyward. We continued on. From here 75 km left, mostly heading due south. The first 15 km would be a gradual downhill (1% or so) and the entire leg had a nice stiff tailwind, to counteract the heat and frequent traffic lights. We made good time (Jerome competing with, and out sprinting, Azuma-san in the final kilometers; me saving my last few muscle fibers and already thinking about Itoigawa and wondering if I would recover fully in two weeks). Despite the various false starts, missed turns, and 4 1/2 hour stretch off the bike at Nagaoka, we finished in under 36 hours. We still have some things to learn as Brevet riders. First, once we decided to sleep, we really should have given ourselves another hour or two of rest. We had plenty of margin for error to finish under 40 hours, and I think if I had slept 1-2 more hours, I probably would have shaved an hour off of the time I spent on the climb up Route 17. And in hindsight, we each would have done this much faster if we had ridden alone instead of waiting for each other. Jerome would not have waited for me at the first checkpoint, or, a much longer wait, at the top of the climb on the return leg. And I would probably have pushed on, despite the rain, from the 4th checkpoint on Saturday night, not stopped at Nagaoka but continued another 65-75 km to "Kenko Land" -- the 24/7 public bath/onsen and rest house in Yuzawa, which would have made Sunday a reasonably short day. Finally, if driving to an event, always good to check that all your gear is in the car before leaving home! Thanks for this entry, and your blog as a whole. I really do like to read about your brevet/marathon events. I am far far away from doing such distances, so you have my highest respect. And your blog really lets people feel what you felt out there, keep going. but did he have his string vest? Seriously, you are both insane. That distance is a 4 day holiday at least. Hm. Congratulations to finish a 600 km brevet seems to be appropriate in the first place. On the other hand it is obvioulsy crazy to ride 600 km in less than 40 hours partly in the rain. To ride 1.400 km within 15 days is completely insane. David, Juliane and me did 760km in six days on Mallorca and we were pretty tired afterwards. 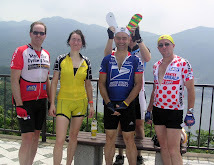 On a different note the population of Niigata, Gunma and Nagano should be glad that Jerome didn't forgot to bring his cycling cloth to the event as I am sure he would have completed the brevet nevertheless wearing some spare underwear from a lung-on-a-stick Japanese participant. The picture forming in my head makes me shiver already. And, yes your advise to check if the equipment is complete before leaving home is well intended. However, this will prevent us to write good stories on the blog! 40 hours of suffering are nothing compared to a good story that can be told a lifetime. Congratulations, you are now qualified for Paris - Brest - Paris. I know that Lawson below Mikuni Toge well, and also have done the climb to the other side of the tunnel, but not beyond, once. The Gunma race track is very close. Also have done part of the valley leading up to Yuzawa. It's a nice area, and Mikuni Kaido is surprisingly low in traffic. Manfred von Holstein, commenting on the Aoba 400 brevet on April 25th. "Totally insane. First of all, riding through all this beautiful landscape in the rain and in the dark - what misery! Secondly, doing all of this to be able to enter the ultimate torture - 1,200km of pure suffering. This is only for the very toughest!" "Once again, this is totally impressive. Most of us would boast having made the 300km to Niigata - for you it was twice as much..."
MOB: Thank you for pointing out something that I missed in an otherwise way overlong post -- I'm qualified for PBP 2011! I'm going to Paris! Tom: Please join us at the start of a future Brevet and I'll enjoy riding with you the first few kilometers ... then you can go ahead with Kondo-san. This kind of event was made for you. If you find the lady with the snacks in her handlebar bag intriguing, all the more so. I don't have any more Brevets in my schedule until after PBP ... but would like to fit in another one in late September/October.